Understanding your parents and their motivations is a difficult and uncomfortable act for most of us humans. 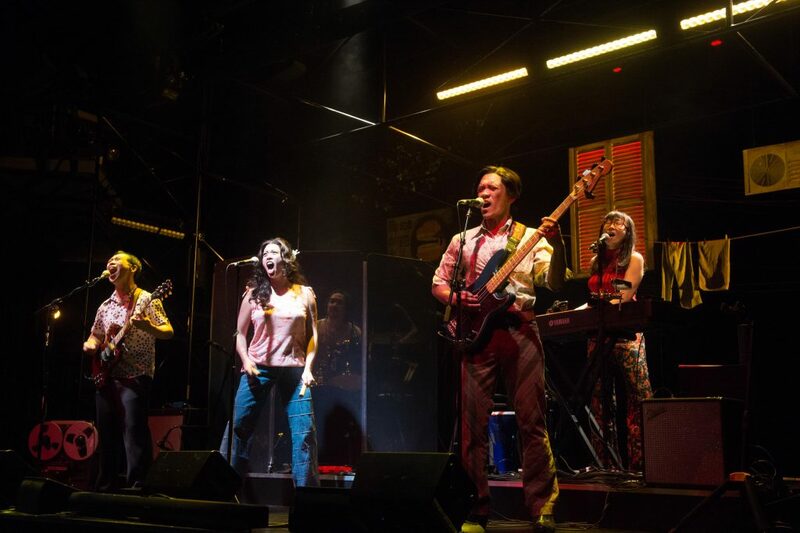 In Cambodian Rock Band it’s an impossible task for first-generation American Neary (played by Brooke Ishibashi) whose Cambodian-born parents don’t talk much about the pre-USA times. Neary, a thoroughly American young adult, has decided to go to Phnom Penh and work with NGOs to bring to justice people who helped the Khmer Rouge. She’s gathering evidence against the superintendent of S21, a notorious killing prison, when her father (Chum, played by Joe Ngo) suddenly arrives at her door. The father has not returned to Cambodia since immigrating to America, Neary cannot admit to her father that she has a boyfriend much less talk to him about her work, he cannot clearly explain his presence, and soon we go back to 1975 before the Phnom Penh fell to the Khmer Rouge and an American style rock band is rehearsing and recording. We’re accompanied/sent into our adventure by Dutch (Daisuke Tsuji), a hyper-friendly, hyper-athletic, hyper-active tour guide. Our initial moments of time traveling don’t reveal too much. I am not even sure we understand which actor is playing a 1975 version of themselves and which actor is playing a completely different character. We learn that western rock is very popular in Cambodia and watch a tape being made. The band members are aware of the communist uprising and the rebels’ hatred for western trappings. But, the band confident that the Khmer Rouge will not take the capital because America is defending it. In the same scene, Phnom Penh radio reports that USA troops have abruptly left the country. The Khmer Rouge take over and quickly begin killing anyone with a college degree, intellectuals, … and musicians. Joe Ngo (Chum), Brooke Ishibashi (Sothea), Jane Lui (Pou), Abraham Kim (Rom), Moses Villarama (Leng). Photo by Jenny Graham, Oregon Shakespeare Festival. The main course begins: we start watching members of the Cambodian rock band in the years of the Khmer Rouge terror. Spoiler alert (but, how else could it be? ): Chum/Dad was a member of the rock band, and part of his reluctance to talk to Neary about the old days stems from the fall of Phnom Penh and time spent in Prison S21, the institution run by the man she is building a case against. The centering on the rock band to tell the story of immigrant Cambodian parents and their first-generation daughter is a brilliant way to get at the culture and chaos of the pre- and post-Khmer times. We learn so much — too much — about the horror that Pol Pot’s regime brought to the people. When I am reminded that the Khmer Rouge killed 2 or 3 million people, I am appalled. But, when I see what happened to individual people — and the action happens 20 feet away from where I am sitting — I feel the fear, anger, and grief. The trite truism is made real: there are more victims than those who were killed. CRB is rich with involved, impossible, inevitable, implausible contradictions. An insidious, captivating aspect of this play is its sudden reversals. One moment you watch a character you know being tortured — pretty graphically. The next moment you’re celebrating an relationship breakthrough. You find yourself up and dancing with the resurrected rock band with tears still in your eyes. You are happy about a reunion of characters, and then you find yourself wanting one of them to die. You don’t feel good about this, either. Brooke Ishibashi (Neary), Joe Ngo (Chum). Photo by Jenny Graham. The action is painful, but you find yourself wanting for the audience — and the daughter — to see more. You’re repulsed by the action and yet you’re indefensibly emotionally satisfied by learning additional details about a character. And, unlike some other fine plays I saw opening weekend, I was never comfortable that I knew what the ending was going to be before it arrived. I didn’t feel the inevitability of either happiness or sadness as the play progressed. All of which is to say that Lauren Yee has created an excellent story and has delivered it skillfully. The impact of the show is increased because of the flawless cast. Most of the actors are musicians, so the Cambodian rock band’s Dengue Fever music is preformed live, on stage, right there. More importantly, each cast member delivers an inspired, completely right, nuanced performance. Applause to Director Chay Yew: whenever all players are perfect, there is damn fine director sharing his or her vision. Yew created a seamless production and he got his actors to on board. I still don’t understand how Ngo consistently made his character lose 30 years when he left a 2019-based scene with his daughter and went back and took his youthful place in the rock band. I swear I saw gray in his hair when he was dad, standing just 20 feet from my seat. But, when he walked another 20 feet to take his place with the youthful band, there was no gray visible. How did he do that? Was it a trick by lighting designer David Weiner? Some magic happened. Equally impossible was the gymnastic flexibility of Tsuji. His jumping and taunting clears a path for the audience to immerse itself in the story. But, then he looks slight and unimposing in other scenes. Another chameleon. Moses Villarama plays both a modern Ted and an historical Leng so differently that you don’t remember him from the other role. As Leng he brings complete conflicted depth to the character. I am not sure many actors could make Leng so right. Speaking of just right, that’s also the set in the three-sided configuration in the Thomas Theater. Thanks to Scenic Designer Takeshi Kata and Assistant Scenic Designer Se Hyun Oh. Most of the action occurs on ground level which expands and contracts depending how far out the step-up rock band stage comes out. A few pieces of furniture set the scenes and the background blends the stage together. But, the design is minimal, rightfully allowing the audience to watch the characters and action without visual distractions. 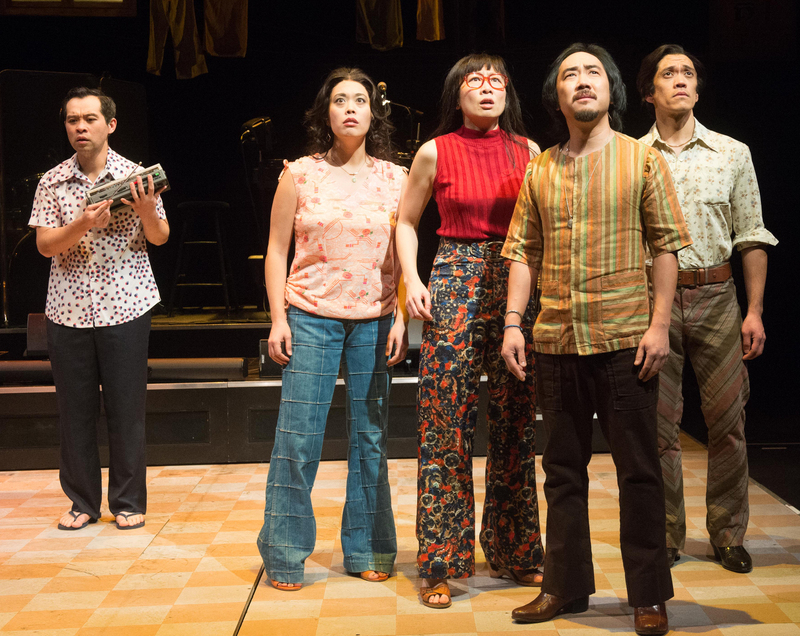 Joe Ngo (Chum), Brooke Ishibashi (Sothea), Abraham Kim (Rom), Jane Lui (Pou), Moses Villarama (Leng). Photo by Jenny Graham, Oregon Shakespeare Festival. 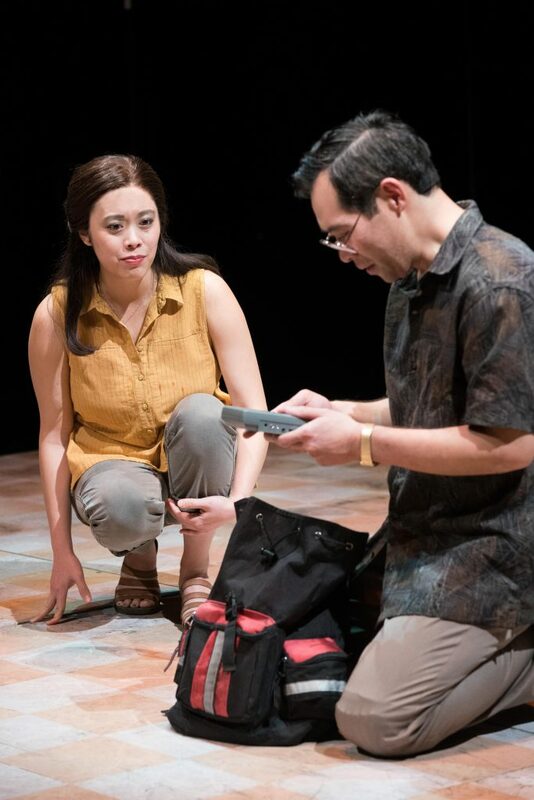 Sara Ryung Clement, Costume Designer, created appropriate looks for very different people and times, and the actors changed clothing often on stage without disrupting the mood or pace. And, her 1970’s band costumes were a kick, especially the scarf thing that winds up in S21. Just everything in and about CRB is quality, and it was my favorite of opening weekend. Yee acknowledges intergenerational differences and highlights how daughter and dad don’t communicate. She lets old country/new country mores clash in her characters. But, the clashing is done with love, if sometimes frustrated love. The audience is drawn into the lives of every character: the young, the old, the well meaning, and the moral horror. All are honored. Excellent! 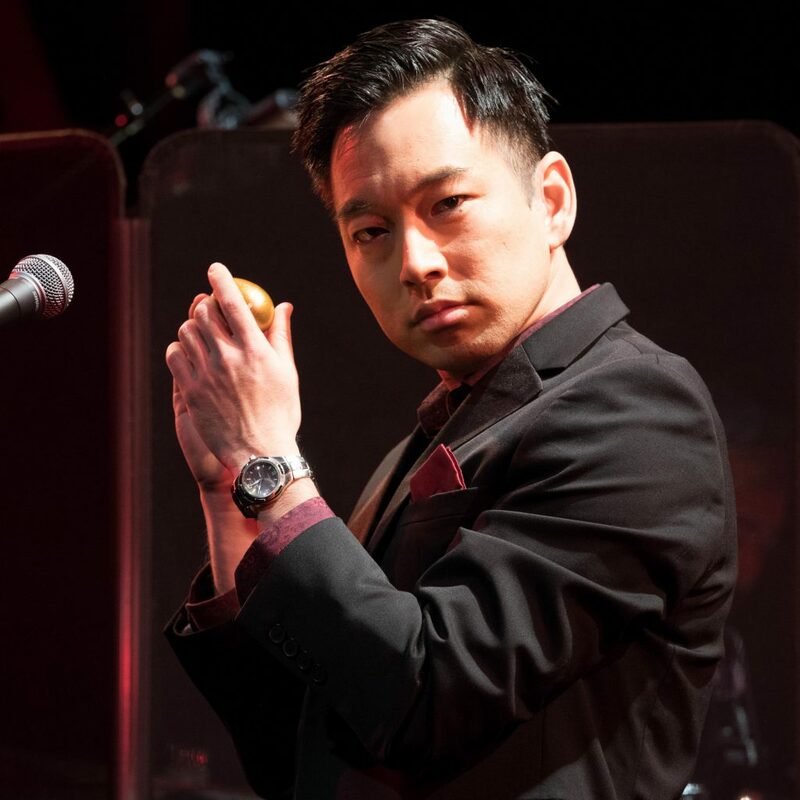 This entry was posted in osf, plays and tagged 5 stars, Asian play, Cambodian Rock Band, Lauren Yee, new plays, Oregon Shakespeare Festival, OSF. Bookmark the permalink.